Cyprus is the third largest island in the Mediterranean after Sicily and Sardinia, a fertile place with mild climate, good natural harbours and rich mineral resources. Due to these favourable conditions, it attracted human populations from as early as the 10th millennium BC. Since then, it has been inhabited continuously, producing an exceptionally rich archaeological record with considerable cultural achievements and evidence of interaction with neighbouring areas. Cultural contacts and exchanges were of major importance for ancient Cyprus. Located at the crossroads of Europe, Asia and Africa, the island was always a meeting place for people and ideas coming across the sea. Influences from Greece, Anatolia, Egypt, and the Near East can be traced in almost every aspect of ancient Cypriot culture, from language and writing to art and architecture. Reception, however, was not passive. Elements from different cultural traditions were frequently mixed with each other and with local idioms to produce hybrid forms and styles. This fascinating process is especially prominent in the spheres of art and religious expression. How did these influences arrive at the island? Was it only through direct human contact, trade, migration, diplomacy, or even war? What was the impact of other types of interaction, e.g. artistic exchange, the diffusion of technological innovations, and the development of common elite ideologies across regions? What meaning did foreign ideas acquire in their new contexts? And how important were these for the identities of local people? These are some of the questions addressed in the exhibition “Ancient Cyprus: Cultures in Dialogue”, which will be presented at the Royal Museums of Art and History, Brussels, between October 31, 2012 and February 17, 2013. The exhibition is organized on the occasion of Cyprus’ Presidency of the Council of the European Union, 2012, and aims at presenting the unique characteristics of a Mediterranean island, where innovation often co-exists with tradition, and cultural diversity with local identities. 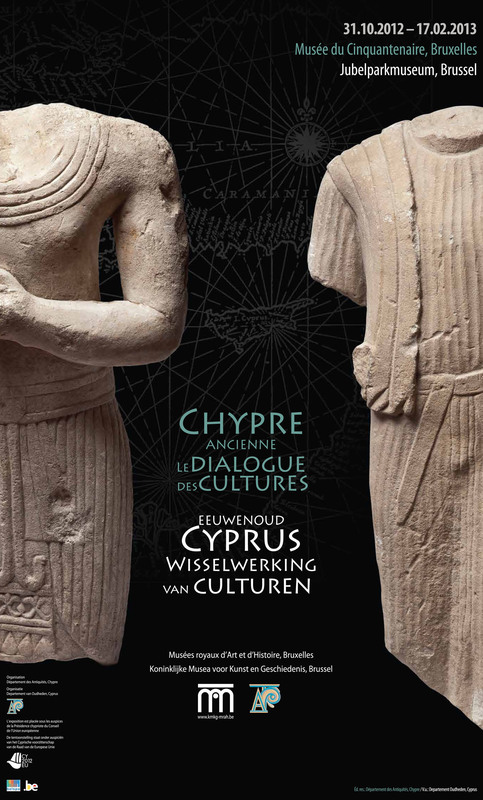 -	The first part explores the history of archaeological research in Cyprus from the time of amateur collectors and “treasure hunters” to the beginning of scientific excavations. -	The second part focuses on the natural resources of the island, with special emphasis on copper, whose abundance made Cyprus a major centre of trade in the ancient world. -	The third part explores the role of the sea in the life of islanders, from the earliest exploitation of marine resources in Neolithic times to the periods when Cyprus was fully integrated into Mediterranean networks of maritime communication and had major harbours of cosmopolitan spirit (2nd and 1st millennia BC). -	The fourth part explores the impact of cultural interaction on various levels of society, from official administration and elite ideologies to daily life and the languages of people; it also examines how foreign elements were perceived and integrated into local traditions. -	The fifth part focuses on funerary practices; death was of major importance for ancient Cypriots, and burials provided an opportunity for social display. Tomb finds offer valuable information about the symbolic world and suggest ideological links and affinities with other Mediterranean cultures. -	The sixth part explores the complex issue of religious syncretism and how local divinities were assimilated with gods and goddesses of the wider Mediterranean area giving rise to new, original forms of religious expression; in that direction, the various transformations of the Great Cypriot Goddess, commonly known as Aphrodite, are very instructive. Cyprus was one of the most prolific areas of cultural interaction in the ancient world. Its rich history offers us the opportunity to explore how ancient societies communicated and how they developed creative forms of cultural dialogue. Understanding these aspects is crucial in this era of multiculturalism and globalization, when traditional cultural barriers are challenged and interaction among people from different cultural backgrounds increases.